Bob the Builder is a CGI animated children's television series and a reboot of the British animated television show Bob the Builder. It was first broadcast in the United Kingdom on Channel 5, beginning on 1 September 2015 and PBS Kids in the United States in November. As of January 2018, it has been removed from PBS Kids' lineup. 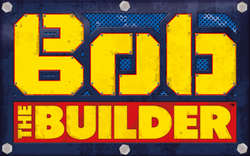 After the original show ended in 2012, Mattel bought the Bob the Builder franchise for a revamped series which premiered on Channel 5 on 1 September 2015. The series was given a visual overhaul for both the characters and the scenery, with Bob and his team moving to the bustling metropolis of Spring City. The CGI animation remained and the construction projects and buildings are significantly larger and more advanced. Mr. Bentley is now seen with a new character, Mayor Madison and a new builder named Leo joined the building team. Several new vehicles were also introduced, including a heavy delivery vehicle named Two-Tonne. Turner Broadcasting System later bought the UK broadcasting rights for the 2015 series to be repeated on Cartoon Network UK's sister pre-school channel Cartoonito UK. The channel began airing the series in January 2016.After the first season ended Rainmaker Entertainment announced that they have ceased animating the show due to issues the company was having at the time. DHX Media announced that they have started work for the second season and that their Halifax studio have officially replaced Rainmaker Entertainment. The show also airs on Family Jr. in Canada. In Australia, Bob the Builder premiered in 2016. It airs on 10 Peach (formerly known as Eleven) every weekday morning. The reboot was very poorly received by long time fans of the older series. Criticism focused on the characters' redesigns and the changes to their personalities. ^ "Boomerang UK And Cartoonito UK January 2016 Highlights". RegularCapital.com. Turner Broadcasting System. Retrieved 14 January 2016. ^ Campbell, Tina (12 October 2014). "Bob The Builder gets a makeover: 'WTF have they done?' asks everyone". Metro. Retrieved 2 June 2017. This page was last edited on 9 April 2019, at 20:48 (UTC).